Minnie Goetze (Bel Powley) is a teenage girl longing for love, acceptance and a sense of purpose. Desperate for attention, Minnie begins a complicated love affair with her mother (Kristen Wiig)'s boyfriend, Monroe (Alexander Skarsgård). What follows is a sharp, funny and provocative account of one girl's sexual and artistic awakening - truthfully told and without judgment. Diary Of A Teenage Girl is an engaging film that explores the power of teenage female sexuality. And they don’t come around all that often. As a result, while her journey is often unsettling, I found this film both inspiring and empowering. Bel Mooney is superb as Minnie. She gives an utterly convincing, funny and endearing performance. We meet Minnie shortly after the loss of her virginity - as she adjusts to her new status in life. Sadly, her first sexual experience is with her mother’s creepy boyfriend Monroe (brilliantly and rather bravely played by Alexander Skarsgård). Diary Of A Teenage Girl could easily have focused on Monroe and made Minnie the victim. However, director, Marielle Heller, chooses to concentrate on Minnie’s experience. Even as their relationship becomes ever more toxic, Minnie (unlike Monroe) emerges stronger and more powerful. Diary Of A Teenage Girl is a wonderfully visual movie. Set in 1970s San Francisco, the film has a perfect, sepia tone. This 'look' combined with the soundtrack, outfits and props create an authenticity of both time and place. Meanwhile, Heller also plays with light and colour throughout the film – and this is particularly effective when Minnie starts to experiment with drugs. Diary Of A Teenage Girl is based on the book by Phoebe Gloeckner and features interesting (and also often unsettling) visual effects inspired by this text. Having not read Gloechner's book, I am left wondering how much more I could have gleaned from this movie if I had. How much am I missing out? Diary Of A Teenage Girl is an impressive film with a superb central performance. I hope that it inspires more movies that explore similarly important and powerful themes. I watched Diary Of A Teenage Girl as part of my Women In Film season. Diary Of A Teenage Girl received a controversial 18 certificate rating by the BBFC (Click here to read the BBFC's report). Many supporters of the film felt that this was an unfair decision - particularly as teenage girls would be unable to watch the movie. I was also surprised and somewhat disappointed that this film had an 18 certificate. The BBFC was accused of gender bias. However, the organisation defended its position stating that the level of sexual activity and drug use seen in the film warranted an 18 rating certificate. 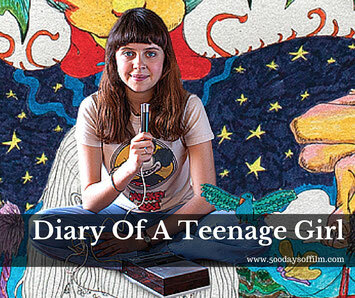 Have you seen Diary Of A Teenage Girl? If so what did you think about this film? Do feel free to leave your thoughts in the comment section below!